Thursday was a day for indoor snuggling, which is exactly what the girls and I did that afternoon. The three of us holed up on my bed, the girls insisting I make a tent by holding up the blankets until my arms and legs ached. "Mom I need a flashlight," Lily told me her eyes wide under her sheet bunker. Jovie peeked out from behind her, "TEEEEENT!" she yelled. I got the flashlight and resume my position. "No TEEEEENT!" Jovie yelled, knocking my away and causing partial collapse. "Mom! Make a tent!" Lily demanded. So I did again. Jovie moled away. Holding the flashlight in front of her face, Lily decided it's storytime. "Mom, I'm going to tell a story," she said. And I got excited. Because I love stories and telling stories and now my 3 year old is about to tell a story and it feels like a moment to remember. Once upon a time, there was a brave cat named Delaney. One day, she got rescued by a bear. She married a penguin and then fell into the water and got all clean. Once upon a time, there was a brave dog named Snacks. One day, he got rescued by a bear. He married a penguin and then fell into the water and got all clean. It's a solid story, I feel. Albeit with some plot holes and no clear antagonist … but nonetheless there's a protagonist (a brave one at that) and things happen to him/her and then the story ends. I amuse myself for the remainder of the afternoon by remixing Lily's story -- answering some unanswered questions, connecting dots, creating some rising action, etc. "Lily's Story: As Told by Mom"
She lived in the basement of a modest brick rancher with two other cats, a dog and a herd of hairless bipeds. The two youngest hairless ones were aggressive in their affections, clamoring to pet the soft, billowy Delaney and promising to be gentle. But Delaney was shrewd and she quickly learned that the hairless ones didn't seem to understand the definition of the word "gentle." No sooner would their mother turn her back to tend to the mountains of laundry when they'd scoop Delaney up under her furry leg pits and drag her about the room like a terrestrial drowning victim. It was for this reason Delaney spent most of her days crouched beneath the futon -- just out of reach of their small, sticky fingers. In her heart, Delaney was not an under-futon croucher. She was a fearless hunter of other cat's tails. An intrepid stalker of glowing red dots and ever vigilant of the drooling canine who patrolled the upstairs. 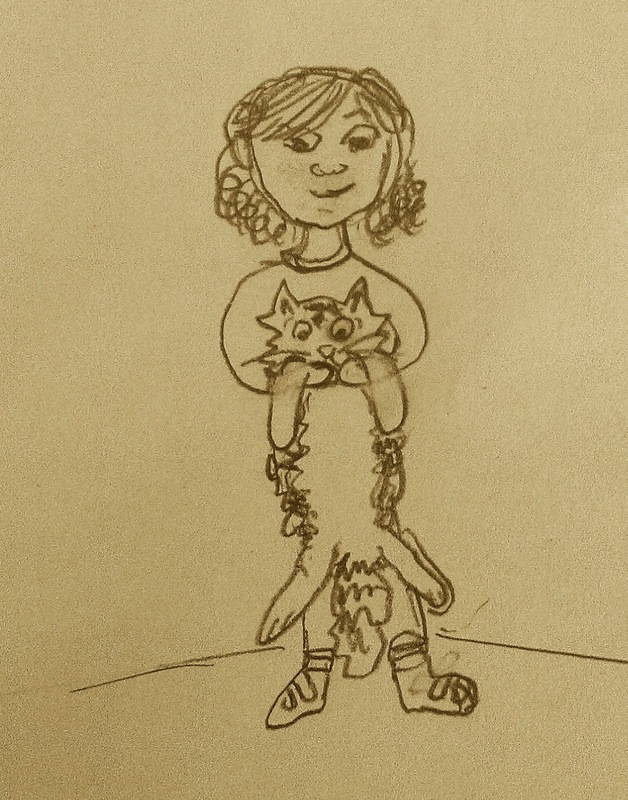 So one day, seeing the door to the garage ajar, Delaney bounded up the basement stairs in a blur of tabby fluff. Just as she closed in on freedom and adventure, the hairless ones came shuffling behind her loaded down with bags, blankets and dripping drip-free sippy cups, chattering about something called a "zoo." Not wanting to be apprehended, Delaney leaped into the back of the car. "Where are we going?" said the larger of the small hairless ones as her mom strapped her into her carseat. "We're going to the zoo," her mother, really a two-legged burro laden with cargo, said. "Mom!" the larger of the small hairless ones shouted. "Where are we going?!" "I just told you," her mother said. "The zoo!" the larger of the small hairless ones shouted. "What do we do at the zoo?" "We see lots of animals." her mother replied starting the car. "Bears and lions and monkeys and lots of animals." "Mom! Where are we going?" The conversation proceeded in this manner for 45 minutes, until the car was parked and the engine turned off. As the hairless ones unloaded their offspring and their offspring's various provisions, Delaney leaped out of the car and bounded past a rainbow of sparkling minivans for the treeline. Invigorated by the fresh air, the warm sun and end of basement cuddling, she pounced on bugs, chewed on ferns and peered like a panther behind shrubbery. Until she heard a heavy grunt and caught the whiff of something pungent. With the snap of a twig behind her, Delaney bolted up the nearest tree in terror. "YoooHalllooo!" called a voice from the ground, dripping with honey and concern. "Are you alright up there?" 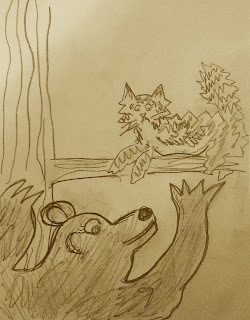 She snuck a glance down, her stomach churning with vertigo, and saw an enormous bear starring up at her. "I'm fine! I'm fine!" she whispered. "Well, you don't seem fine!" the bear called, reaching her giant claws up the trunk. "No! No! I'm great! I'm OK. Just umm. Just enjoying the view," she tried to sound relaxed and breezy. Like the wooden precipice perched over the jaws of death was really a hammock on a sunny day. "Are you sure hon? You're looking a little woozy! I'm just going to come up and check on you." Delaney could not see how this lumbering she-oaf could climb the tree, so she stayed still -- but then the tree began to sway. 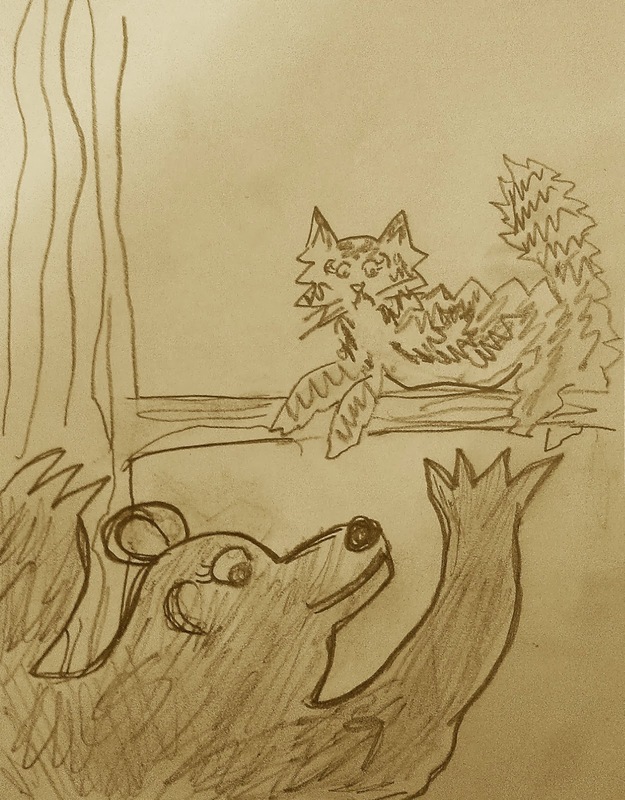 And there was the bear, scaling the tree like a ladder. "Just stay right there hon! Sorry about all the rocking! It's fall you know, I've been packing on a little winter weight, you know how that goes." "Oh. Don't go to the trouble! Really." Delaney began edging down the branch, which bowed under her weight the farther she inched. "It's no trouble. You don't look like you're from around here. Are you new? Did you get out of your exhibit? The Red Panda gets out every other day and comes over to say hi and there's always a big hullabaloo with the keepers. Very exciting! I can help you lay low until dinner if your want. They just left my lunch in the den so I don't think anyone will be around to check for a little bit. There I go again rambling on … what did you say your name was?" "Delaney. I'm Delaney. And I don't live here. I have a family." She was midway down the branch. "Oh hon, we all had families. Mine was in the Cincinnati Zoo and then I got moved here and it's different and I miss the kids and all, but it's quite lovely here. And you'll just love the food. Why don't you just come back this way and I'll help you down. I'm Louise by the way." Louise extended a paw -- her claws ragged knives. Delaney leaped off the branch. Time slowed as she fell -- angling her body to land feet first -- when she was jerked sideways and slammed into Louise's broad chest. "There, there Delaney. I got you!" Louise felt a wet nose on her head and a long tongue slapped her cheek. "Guess you lost your balance, eh? Which is strange, you being a cat and all. The bobcats are always bragging about how graceful they are. Always laughing at me when I say I'm not a bad climber myself. They can be kind of insufferable. No offense. But you're not a bobcat anyway, are you? You're much too little. But so soft! Oh my. What kind of cat are you?" "I'm a house cat. Can you put me down please?" Delaney was suffocating from the bear's feral musk. Not to mention the terror the that any second the amiable behemoth could decide it was snack time. "Oh sure dear. There you go." Louise placed Delaney on the ground as soft as an egg. Delaney breathed a sigh of relief. "Thank you Louise." Delaney relaxed. "I really should find my family." "Well off you go then hon. If you change your mind, my den is right over there," she pointed her now less-imposing claws toward a rocky outcropping near a fence. "There's a hole in the fence over there that you should be able to fit through." "OK. And Louise, I think you're plenty graceful," Delaney said. Louise grunted in satisfaction and ambled back to her den. Delaney crawled through the fence and was faced with a stampede of strollers and marauding hairless ones. She dodged feet and wheels. She ducked under a nearby trashcan to collect herself. The Louise's stench clung to her like jelly, so Delaney set to work scrubbing it off with her pinkie finger sandpaper tongue. The effort was futile. After several minutes of bathing, she still smelled like bear. She gagged, sending a soggy skein of fur onto the concrete in front of her. Disgusted she crept from underneath the trashcan hoping her family would pass by. But while their were plenty of hairless ones and their terrifying progeny, there were none singing the theme song for "Sofia the First" while dancing. None demanding chocolate milk and fruit snacks in ever-elevating octaves. No small feet clomping by in glittery pink princess snow boots. This vantage point was not ideal, so she sought higher ground. Behind her was a towering, terraced stone wall. She jumped on the shortest ledge and made her way up toward the top using each ledge as steps. Once there, she could see Louise scratching her back on a tree, a dead-eyed camel gnawing on its lower floppy lower lip and a ribbon of black asphalt dotted with dozens of hairless ones winding its way through the enclosures. She scanned the crowd. "Hey! HEY," a voice squawked from below. Startled, she nearly fell off the wall. Looking down, Delaney saw a frenzy of black and white birds flapping shuffling about a rocky shore at the edge of a large pool. Honking and beeping like brass section warming up for a symphony. "Hey BOBCAT! What are you doing up there?" "I'm not a bobcat. Just looking for my family," Delaney said, still searching. "Yeah, I guess you look a little small for a bobcat … and oh, yeah … there it is… you have a tail. Wow. That's a really fluffy tail you have there. It looks so soft and cuddly." Delaney wrapped her tail self-consciously around her feet. "Thank you," she replied, her curtness thawing. Now, Delaney, like most cats, wasn’t one to be bothered with favors. But she had a soft spot for little ones – even the younger hairless ones in her own house – as much as she loathed being dragged around the house, she still missed them. Delaney bounced down the wall and into the enclosure. The cacophony grew. Penguins jumped in and out of the pool, constantly flapping, shaking their heads and walking around like their ankles have been tied together. She padded over to Carl. “Gee, that was just so nice of you. You’re even more beautiful up close. And so soft and fluffy,” he stared at her moony-eyed. “Right! Here’s the apple of my eye.” Carl stepped back exposing a round gray object. Delaney had never seen a penguin egg before, but she had seen plenty of rocks. And this object appeared more mineral than animal. Delaney was all but certain that Carl the penguin did not have a sense about these things. But she said nothing and instead settled on the egg, which felt cold and hard. As Delaney attempted to get comfortable another penguin waddled over. “I see Carl got someone to sit on his rock,” she snickered. Dolores stared at all the birds – unable to differentiate one from the other. Just then Carl shuffled back with another penguin trailing behind. “Make what official?” Delaney did not like the dewy look in Carl’s eyes. “No!” Delaney jumped off the egg, which rolled down the rock they were standing on. Carl was not concerned. “But I didn’t say yes!” Delaney pleaded. 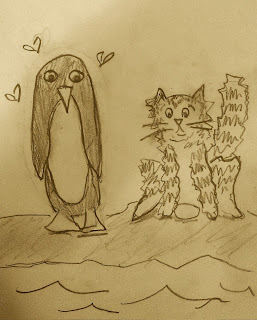 Though not a swimmer by choice, Delaney took one look at Carl waddling lustfully toward her and leaped into the frigid pool, boiling over with penguins. She swam to the opposite end of the pool and climbed up the stone wall onto a ledge blocked by a huge plexiglass window. As she frantically licked her sopping paws, calculating her next move, she heard thumping on the glass. And there in front of her, their little noses smooshed in the window, were her two younger hairless ones. Pointing and shouting in glee. After a lengthy explanation, extended negotiations and a complicated rescue operation, zoo officials retrieved Delaney from the penguin enclosure and returned her to her elated family. The larger of the younger hairless ones donated her favorite blanket to warm the soggy cat (who now smelled more like mackerel than bear) and the smaller of the pair kissed her repeatedly on the head. Delaney nestled between their two car seats and as she drifted off to sleep, she heard the mother ask her children what they thought had happened to Delaney at the zoo. Already, Lily has mastered the art of concise writing in a way I obviously struggle with.